As predicted here, the Wisconsin Assembly Thursday evening passed a bill granting high-tech manufacturer Foxconn billions in precedent-setting taxpayer subsidies along with state exemptions from fundamental Wisconsin environmental protections and clean water guarantees. So who is surprised that with a Governor who made wetland-filling a priority in his first days in office, and as the Foxconn package is being incautiously fast-tracked towards Walker's desk for a pre-election campaign boost, that the same GOP legislative wrecking crew which earlier had tried and failed to flatten, fill and pollute the Penokee Hills and Bad River watershed wetlands at the edge of lake Superior for an out-of-state coal mining magnate is returning to that template with a bill to overturn the state's mining moratorium. Their bill is known as The Mining for America Act. The Mining for America Act will eliminate the nearly 20-year ban that the legislature placed on Wisconsin’s mining industry. The moratorium sets strict conditions for mining to occur in Wisconsin, including proof that mines haven't polluted Wisconsin waters. As I asked the other day, if Foxconn can have these privileges, why not others? Want something like this in a watershed near you? 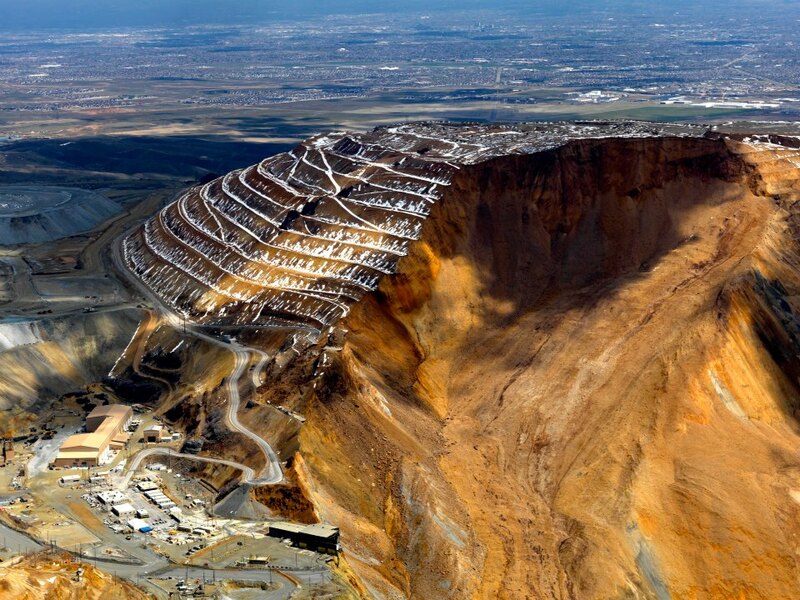 Aerial shot of landslide in Bingham Canyon copper-gold mine near Salty Lake City, Utah. Photo courtesy Kennecott Utah Copper via Facebook. James, I think it is time that you and other "political analysts" in this state find a way to push for a referendum on the Foxconn bill, and here is why: We as citizens have no voice. I am an independent and can call my senator, she has zero say because she is in the minority party. If we look at this from the "we have been "gerrymandered" perspective, the majority of Wisconsin citizens have been made irrelevant. I firmly believe a referendum, which will not have an incumbent's name recognition, would solidly show Wisconsin citizens' disgust with this bill. Many conservatives that I know feel that we've cut money for schools, parks, and transportation, so we could get our feet back on the ground and then could rebuild this state's infrastructure. Wow, did they get screwed. The state finances are still a mess. We had to raise our property taxes to rebuild our schools. Our roads are the worst in the nation. Our state parks have no workers left. Yet, we have billions to give away in corporate welfare to a foreign company with a bad history. A referendum would at least force all of these jackasses, including Barca, to have public meetings. If it really is the great deal these clowns are all drooling over, then we could actually see why. Regrettably, WI is one of a very few without a process for direct initiatives where citizens can petition for a referendum. Only the Legislature can put such matters on the ballot. And unless the gerrymandering case is won in the US Supreme Court, and progressives can field electable candidates statewide, this heavy, pro-corporate legislative majority is with us for a long time.